A basic tenet of the cell theory is that all cells arise from pre-existing cells, and one hallmark of all living organisms is its ability to reproduce. The German anatomist Walther Flemming, a leader in the science of cytogenetics—the study of the cell’s hereditary material, the chromosome—played a pivotal role in our basic understanding of these phenomena. In 1879, he developed and used an aniline dye to visualize the structure of the nucleus from salamander embryo cells. Within the nucleus was a coiled mass of threadlike material, which he called chromatin. He observed that these paired threads—later named chromosomes—split longitudinally into two halves, with each unpaired thread half moving to the opposite side of the cell. He named this process of chromosomal splitting mitosis (Greek = “thread”) and described it in his 1882 book, Cell-Substance, Nucleus, and Cell-Division. Later scientists discovered that immediately after mitosis—involving the separation of chromosomes in the nucleus, and consisting of six distinct phases—the parent cell divides into two daughter cells, each identical in cellular content to its parent, in a process called cytokinesis. Flemming was not aware of Gregor Mendel’s work and his rules of heredity, nor was he aware that traits are transmitted by genes contained in chromosomes. Thus, the import of the discoveries by Mendel and Flemming were not appreciated until the early 1900s, when genes were recognized to be the functional unit of heredity. Mitosis is among the most fundamental of all biological processes in all living organisms: The number of cells increases, and the organism grows by mitosis—the process by which all single-celled organisms reproduce. Mitosis repairs damaged or worn out cells and tissues. Moreover, the applied study of mitosis has led to stem cell technology in which undifferentiated stem cells can differentiate into specialized cells. 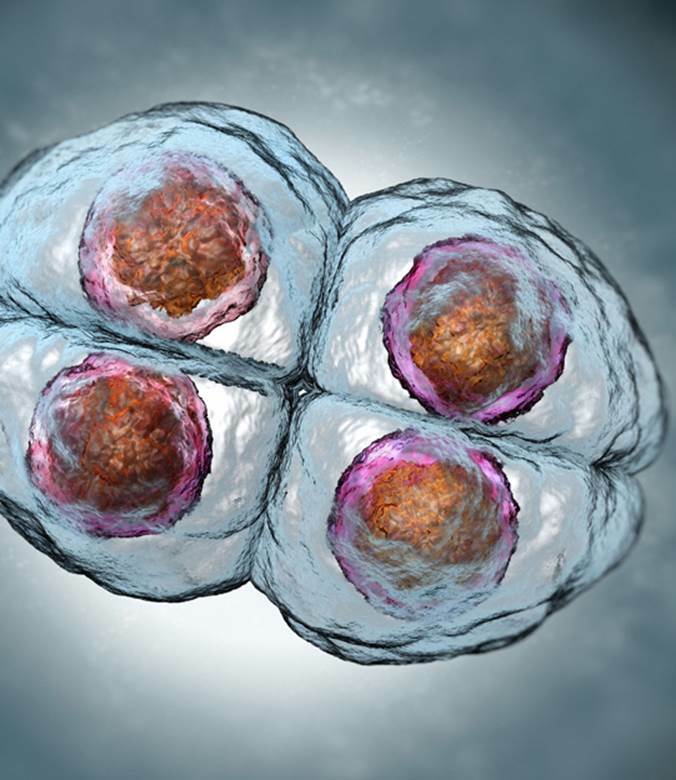 Errors in mitosis can lead to cancer. Hence, we can readily understand that the discovery of mitosis and chromosomes is considered to be one of the ten most important in cell biology and one of the one hundred most significant of all scientific discoveries. SEE ALSO: Cell Theory (1838), Mendelian Inheritance (1866), Meiosis (1876), Genetics Rediscovered (1900), Genes on Chromosomes (1910), Induced Pluripotent Stem Cells (2006). Mitosis, one of the most important processes in biology, refers to the division of a “parent” cell into two identical “daughter” cells.